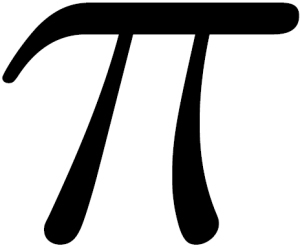 Tomorrow is Pi Day 2015! March 14, 2015, otherwise written as 3/14/15. I wrote about Pi Day last year, but this year is even more special. Not only does the written date go up to five digits, but it’s possible to go all the way up to ten digits, if you celebrate Pi Day 2015 at precisely 9.26:53am. Pi is 3.141592653 up to ten digits. Alex Bellos has written a great piece on tomorrow’s special occasion over at The Guardian, and Slate also have a decent article dedicated to it. It’s also Einstein‘s birthday, so happy birthday to him! Remember to celebrate (by eating pie) at 26 minutes and 53 seconds past 9 o’clock in the morning tomorrow for a truly authentic Pi Day experience. Onwards! This entry was posted in Ramblings, Science and tagged 3.14, 3.141592, 3.141592653, Alex Bellos, Einstein, Happy Pi Day, mathematics, maths, Pi Day, Pi Day 2015, pie, Slate, The Guardian. Bookmark the permalink.